In Brief: Follow a trail through the Changping countryside, passing villages, quarries, and a local shrine on the way to the Silver Pagodas, a set of five well-preserved 600-year-old pagodas that are all that remains of a big Buddhist temple. 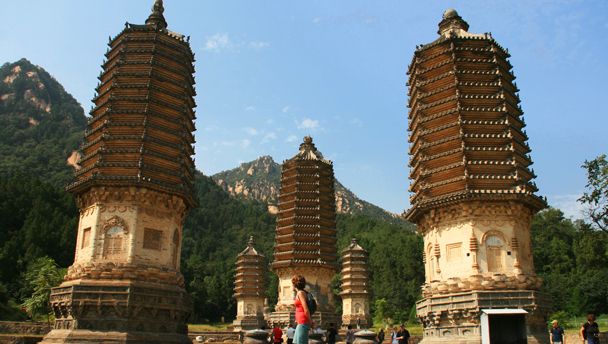 The Silver Pagodas stand on the site of a temple first built during the Tang Dynasty. 3–4 hours start to finish over 10km. This hike is mostly flat, but there’s one tough climb right at the end that will give your legs and lungs a good workout, particularly if you’re not used to climbing in the hills. We start off with a walk through a small village, stopping for a quick look at a 300-year-old performance stage and a temple. The houses in the village are mostly built from granite – likely sourced from a nearby quarry. After walking through the village we’ll follow a slowly ascending path through the countryside, passing an isolated shrine, fields, and concrete water reservoirs as we circle Silver Mountain. The path takes us into a small village on the other side of the ridge, and we’ll follow dirt streets through its outskirts, walking past donkeys and old stone houses on the way to the chestnut orchards behind the village. Around the hill behind the village we’ll find what’s called the “Valley of Mercy”, and this is where the path starts to get a lot steeper, heading past more quarries and following a hillside trail up to the top of Holly Mountain. The valley is not too merciful to the legs. It’s quite a good climb! Towards the top we’ll find the Silver Pagoda park trail, and climb its steps to the viewing platform at the top. We can look down on the pagodas from there, and will have an unobstructed 360° view of the surrounding mountain peaks and countryside. 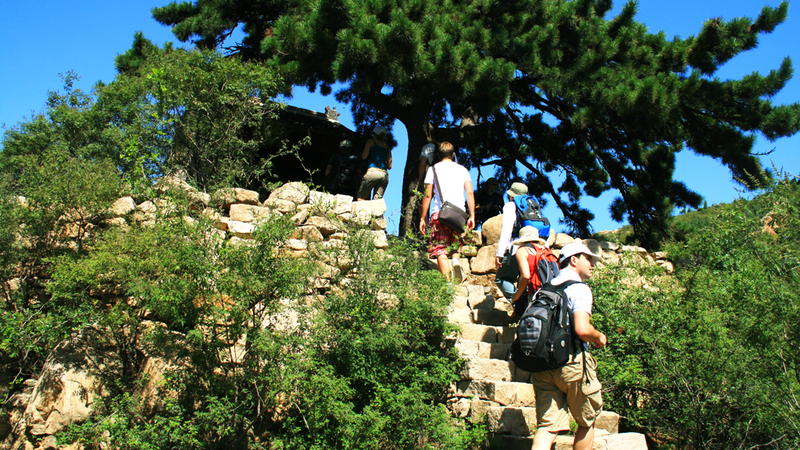 From the top we’ll follow the park trail down to the pagodas, passing “North Beijing’s Number One Waterfall” and many other local landmarks. There are two big bells in the park and we will pass by one of them – it’s quite common to hear them toll as we walk. The site dates back to the Tang Dynasty (618–907 AD), with the pagodas built in the 1400’s. The silver bells of the pagodas used to ring in the breeze, and are the source of the name of this peaceful spot. The temples are long gone, burned during war. After we’re done looking about the pagodas, we’ll follow a nice trail through the hills to get back to the little village where we started the hike. 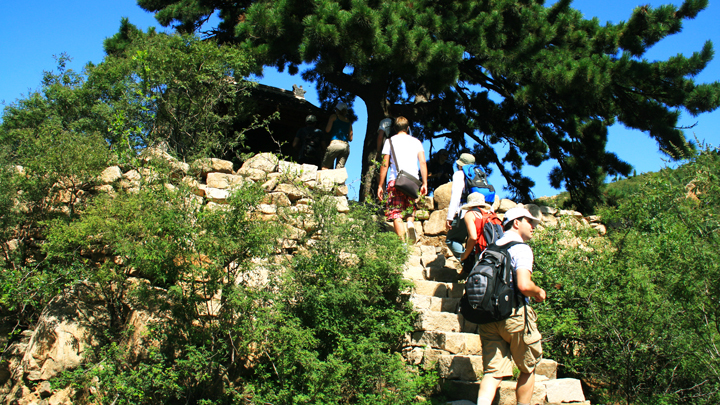 The hike is mostly flat, except for the last climb up to the top of the mountain behind the pagodas. It’s pretty steep! See 14 photos from the Silver Pagoda Loop—a village visit, a shrine by an ancient pine tree, views from the peak of Silver Mountain, plus the pagodas. We did the hike around the Silver Pagodas on a drizzly and misty day—see 15 photos from the pagodas and surrounding countryside. See 14 photos from our Silver Pagoda Loop hike, a stroll through the countryside that passes by the serene site of the Silver Mountain Pagoda Forest. We took the long way to the Silver Pagodas, walking through two small villages and crossing some nice countryside as we went. The weather was clear and crisp – click through to see photos of a very nice day out. This was our first hike after the only big snowfall of 2011 so far. Although the conditions made the hike a little more challenging, it also made the scenery more beautiful. The snow-covered pagoda complex was even more stunning than usual.